Apple is prepared to offer the iPhone 3GS, first released in 2009, as a free subsidized phone with a two-year service contract, according to a new report. Analyst Mike Abramsky with RBC Capital Markets said on Wednesday that Apple is "expected" to offer the iPhone 3GS for free when the iPhone 5 launches later this year. He said this approach would help Apple with mid-market buyers, and would also help the iPhone counter the growth of Google's Android platform. 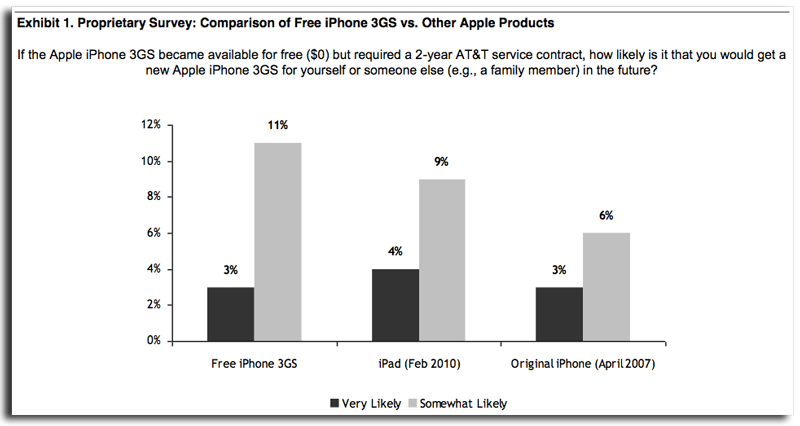 Abramsky sees the offering of a free iPhone 3GS as a way for Apple to double its potential market opportunity to more than 150 million smartphones. A lower-priced iPhone 3GS, offered $399 unsubsidized, would also increase iPhone share globally, he said. The analyst also expects Apple to release what he called a "baby" iPhone in 2012. That later release would avoid iPhone 5 cannibalization, and would allow such a device to better leverage iCloud services. For Apple to still offer the iPhone 3GS after the launch of a fifth-generation iPhone would be a change, as in years past Apple has discontinued its two-year-old smartphone model. For example, last year the iPhone 4 launched, the iPhone 3GS was dropped to $99, and the iPhone 3G was discontinued. In January, the price of the iPhone 3GS was reduced even further, to $49 in the U.S. The device carries an 8GB capacity, half that of the entry-level 16GB iPhone 4, which sells for $199 with a new two-year contract. In May it was revealed that the iPhone 3GS, along with the first-generation iPad, often outsells many newer Android-powered devices. It was noted that older products can offer Apple an aggressive tiered pricing strategy that can help ward off competition. Though the iPhone 3GS was first released in 2009, it will be compatible with Apple's forthcoming mobile operating system update, iOS 5. That update is scheduled to arrive this fall, likely alongside the release of a fifth-generation iPhone.